The beginning of the year is often a busy time for organisations, with budgets to set, annual appraisals to complete, along with new strategies and the pending conference season – all tackled with the additional energy that follows time off over the Christmas holidays. In fact, it is usual to reach March feeling like you have been in a sprint for the previous two months and wondering where the time went. Perhaps reflecting this, in recent weeks I have been hearing the word ‘hectic’ a lot. Whether in emails apologising for a slow response or in a reply to the question of “How are things with you at the moment?”. 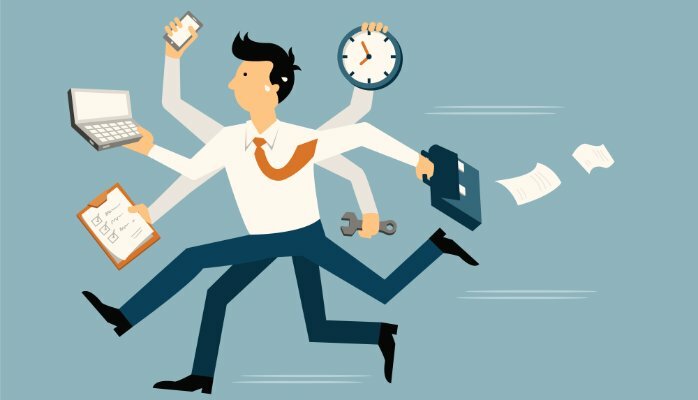 This is worrying, because being hectic is not at all productive and if you are leader, your ‘hectic’ will inevitably result in a pressured and over-busy organisation. Many organisations are undergoing profound change at the moment, whether due to a new leader with a remit for change, industries undergoing disruption due to regulation, changes in raw material prices or being disrupted by competition. It is difficult to find an organisation that is not grappling with profound challenges to its business model which is leading to unmatched levels of change, often applied simultaneously and within organisations that have been relatively stable for a long period of time. Put this way, it’s not hard to understand why many people in organisations, at all levels, are feeling under pressure and barely able to keep up with events and what is being asked of them. In addition to the obvious stress and frustration, it also leads to high levels of disillusionment and the inevitable loss of good people, just when you need them most. Whilst it may not be desirable to slow the change down or ask less of an organisation in transformation, it does not have to result in burnt-out leaders, stressed and frustrated employees and a level of chaotic flux where everyone is in survival mode and unable to prioritise effectively. There are ways to accelerate the pace of change whilst reducing the wear-and-tear on the organisation and the people who work in it. It involves having a clear and positive ambition and ensuring that everyone is working effectively towards the same goals. Sounds simple? It is, but it is remarkable how many organisations do not pay attention to these basic elements and the health of the organisation during times of significant change. Leaders working under the assumption of “They’ll figure it out in the end”; “Change is hard, so I have to drive it through”; or “Change inevitably involves a level of stress and chaos” are missing significant opportunities to leverage their organisation positively during the change process and ultimately perform to a higher level. 1. Is the purpose, ambition and direction of the organisation clear to everyone? Without a unifying ambition and compelling positive vision, change can be unsettling and uncertain, resulting in defensive and unhelpful behaviours. Given sufficient focus and effort it is possible for organisations to create a positive energy behind a particular change. People will rally behind change if they can see that it will result in a better future and they understand the rationale for what is being done. This must be done in a simple and engaging way, replicated throughout the organisation and repeated at every opportunity. 2. Are there (a small number of) clear priorities? Hectic organisations often have too many priorities that don’t overlap between departments resulting in lost energy and ‘friction’ in resolving priorities on limited resources, gaining support on initiatives and repairing fractured relationships between colleagues. ‘Strategy is the art of sacrifice’ and the sign of an organisation that has decided effectively on what its priorities are is a short list of 4-5 ‘must win’ battles. Any more than that and the difficult choices about what not to do are not being made. Not only is it important to understand these ‘vital few’ priorities, it is equally important that the whole organisation knows what they are consistently and how each individual can reflect those priorities in their day-to-day work. 3. How aligned is the top team? I’ve written previously on the importance of an effective and aligned top team, but during periods of significant change, this is especially key. Leadership teams can often fragment during transformations, focusing on their specific areas, easily lapsing into factions and seeing others’ behaviours through a judgmental lens. Additional time and effort must be focused on how effectively the top team operates as a team and how well aligned they are in leading the organisation. 4. Is engagement with the organisation taking a significant proportion of leaders’ time? I know that when I get hectic, the first thing to go is my ability to listen and empathise with others (being too wrapped up in my own problems) and I see the same thing happening in organisations. Time and effort should be given to engaging with employees and listening to their questions, concerns and suggestions. Not only is it likely that many excellent ideas about how to accelerate the change will come from the people actually working in the processes, but it will also help everyone to feel heard and understood and emphasis the message of unity of effort. These question are designed to stimulate thought and reflection on whether you are maximising your opportunity and that of the organisation of which you are part. Additional time investment in any of the four areas described above will always pay off by removing the interference and friction that can creep into organisations during periods of significant change.